For your special projects, we offer many of our popular shapes and sizes of flexible magnetic sheeting in many colors. 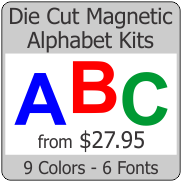 We have the largest selection of colored magnet in the world! 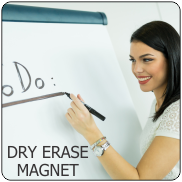 Just like white flexible magnetic sheeting, our most popular item, color magnet is used for craft and industry. This dark brown rubber-like magnet with a vinyl glossy laminte applied that accepts paints, inks, markers as well as objects applied with any glue that sticks to vinyl. Available in ROLLS, SHEETS, SHAPES and CUT TO SIZE pieces. Colored magnet is availble in 7 standard economy matte colors, 32 premium glossy colors and tons of specialty colors and patterns. Unlike other suppliers, we don't mind rolling just 1 roll or even a sheet of vinyl magnet for your special project. Even though we have thousands of products in our catalog, we still make special orders. If you don't see what you need, please ask.